Sometimes it’s nice to have a slightly different hotel experience, and with so many unique and crazy hotels on offer these days finding one really isn’t difficult. What is hard however is choosing which one to stay in. From one-of-a-kind treehouses, to padded cells and all the way up to hotels in the sky, we’ve compiled a list of our favourites for you. Suspended four to six metres above the ground, the rooms in Sweden's Treehotel are certainly very different from your average hotel room. 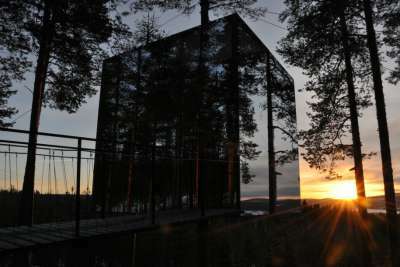 Located by Luleå Airport in a tall pine forest with amazing views of the Lule River, Treehotel has several themed room options available to guests. Choose to stay in The UFO, The Bird's Nest or The Mirrorcube (as seen in photo), to name just a few of the rooms on offer in this unique hotel. 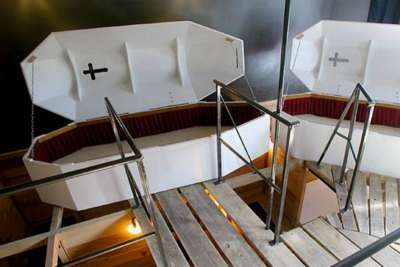 Fancy sleeping in a coffin? Or perhaps a padded cell is more your thing? If neither of these appeal to you then you could always choose grandma's room where the shower and toilet are hidden away in an old wardrobe. From mirror rooms, to flying beds and all the way to an upside down room, the Propeller Island City Lodge has endless imagination. If crazy is what you're looking for, then look no further, you've found it. 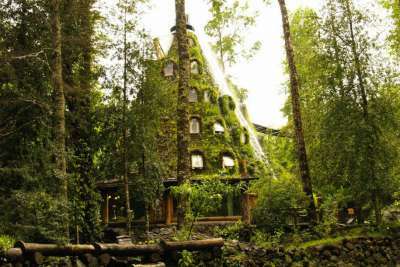 Deep in southern Chile, in the grounds of the Huilo-Huilo UNESCO biosphere reserve, lies the Montana Magica Lodge. The hotel itself looks like a volcano but instead of spewing lava, it is designed to 'erupt' a fountain of water daily down the 13-room guesthouse. The hotel offers lots of activities from mini-golf to South America's longest zip wire! Although the resort is a bit of a drive away, the hotel does offer a transfer service to and from certain airports making travel to the Montana Magica Lodge really quite straight forward. 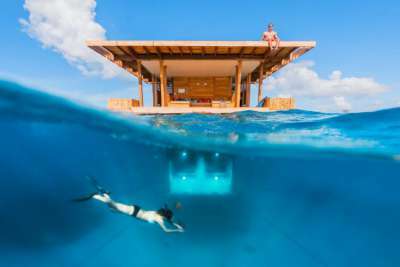 A real one of a kind, The Manta Resort in Tanzania lets you sleep underwater surrounded by tropical marine life. Although the resort has standard seaview and garden rooms, the main focus here is the one and only underwater room. The floating structure located around 250 metres from shore, has three levels. A sun area on the top for soaking up the rays, a lounge and bathroom at water level and then the star of the show, the under-the-sea bedroom surrounded by panes of glass with almost 360 degrees views. 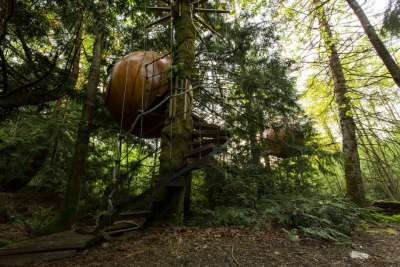 Described as a 'unique and magical forest hotel', the Free Spirit Spheres are the only spherical treehouses in the world. There are three tranquil spheres to choose from each differing in size and available facilities. And with two more designs on their way soon this relatively unknown forest find is a must for those travelling to the Vancouver area any time soon. Spend your time exploring the surrounding area or just peacefully swaying in your sphere. 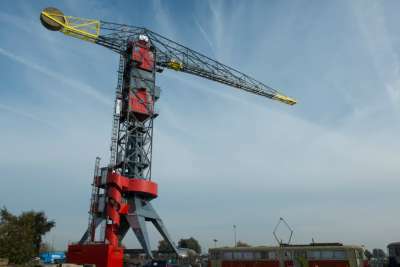 When deciding on where to stay in Amsterdam, cranes don't usually come top of the list, but with spacious and high end suites in the top of the highest crane hotel in the world, why not? It's certainly an alternative way to see the sights of Amsterdam, and with its reputation as one of the most romantic places to stay in the world, it seems like a pretty good option for those wanting a unique hotel experience. Choose from the three rooms on offer and up you go! 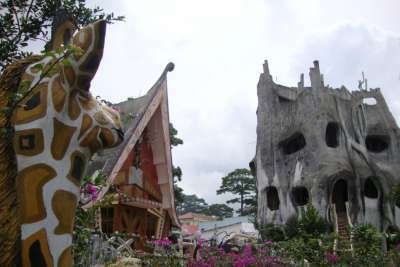 Popularly known as the “Crazy House”, the Hang Nga Guesthouse is perhaps Vietnam's strangest hotel. The overall design resembles a tree and is surrounded by smaller sculptures of animals, mushrooms and caves. Each room in the guesthouse is animal themed and with 10 to choose from, it's a difficult decision to make. Some of the more popular ones include the tiger room, the eagle room and the kangaroo room, each with their own unique features. 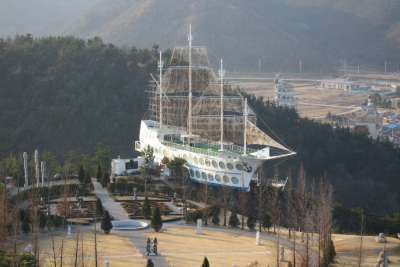 Located on Jeongdongjin beach, Sun Cruise Resort & Yacht is the world's first on-land cruise themed hotel resort. Built at the top of a large cliff, the hotel benefits from fantastic sea views along with the feel of being washed up onto the shore. The theme is enhanced by a salt water swimming pool and the sound of crashing waves that is played on speakers throughout the ship. It's also easily accessible by bus and train which is an added bonus! Despite being awarded the 'world’s biggest image building' title by the Guinness Book of World Records, the Tianzi Hotel has also been named the ugliest building in China. Don't let this put you off though! 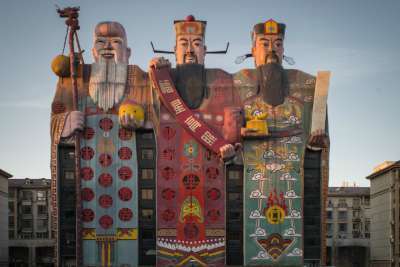 These three men are traditional Chinese gods representing good fortune, prosperity and longevity, so as distinctive as this hotel may be, you can certainly count on a happy stay here. Located on the suburbs of Beijing, you really won't miss this one! Fancy staying in a hotel made purely of snow and ice? 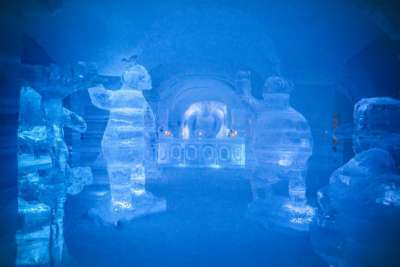 Sure, so it may sound a bit chilly to some, but for those looking for a cool new experience can look forward to a very 'ice stay! Located around 20km from Alta and set on the banks of the Alta River, it is the world's most northern igloo hotel. Every year artists and sculptors change the theme of the hotel, to keep the concept fresh. The hotel also provides transfers for guests from Alta airport so all you have to worry about is how to keep yourself warm!